The Yilo Kroko and Manya Krobo Municipal Security Councils (MUSEC) have placed an interlocutory injunction on organisers of a demonstration on the Odumase-Accra road last week. Some residents, from Nuaso in the Eastern Region were demonstrating against the Power Distribution Services (PDS) over what they claimed was unfair treatment and lack of service delivery from the power distribution company. Although two people sustained gunshot wounds when the police tried to maintain calm, seven people have been arrested and are assisting the police with investigations. The decision to summon the leaders was taken at a joint (MUSEC) meeting between Yilo Krobo and Manya Krobo Municipal Assemblies to discuss the way forward for avoiding subsequent illegal demonstrations. Per the injunction, the seven have been restrained from taking part in any future demonstrations against PDS. ASP Ebenezer Tetteh, Public Relations Officer of the Eastern Regional Police Command told Citi News, the leaders will be made to face the full rigours of the law should they defy the orders. “Meanwhile, we are investigating the seven who have been arrested. When we conclude with the investigations, they will be charged with rioting and other offences that will be levelled against them. 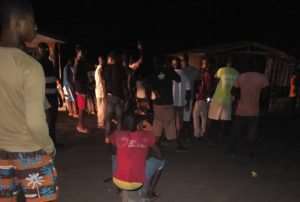 the are currently assisting the Krobo Odumase Police with investigations,” he added. Present at the joint MUSEC meeting were the Municipal Chief Executives (MCES) from both Municipal Assemblies. There were security agents like the Akosombo Police Divisional Commander, the Divisional Crime Officer, the District Commanders from Odumase-Krobo and Somanya, the BNI officers, the National Fire Service Commander and Ghana Immigration Commander from the two Municipal Assemblies. The identified leaders and organizers of the illegal demonstration include Nene Aziza II, Joshua Ogbodzor, Rev. John Apertey, Bernnet Yaovi, Kasimu Teye Kwao Alhaji and Teye Jonathan Korletey. The rest are Griffiths Samuel, Michael Okrah Amanor, Adamtey Ebenezer Jones Dendenden, Moses Kwadjo Atterh and Richard Attuquaye-Fio Clottey.